A backflow device protects drinking water from contamination. By installing a valve in your system it will stop the backflow from occuring. 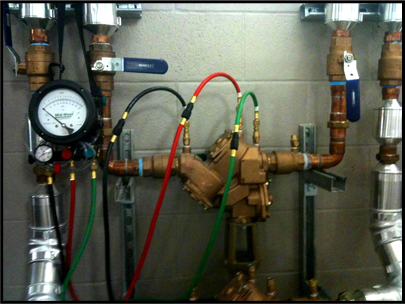 Ensure proper operation of your backflow preventor, the law requires it. The Water Utilities strive to provide reliable and safe drinking water to their community. Many of us, however, take for granted that we can fill our glasses with safe drinking water everyday. Drinking water distribution systems are designed with the intention of the water flowing in one direction, from the distribution center to the many various points of use. Unfortunately, hydraulic conditions can and do exist that may deviate from the “normal” conditions, causing water to flow in the opposite direction. This undesirable reversal of flow is called backflow and can draw outside contamination back into the main water lines. A backflow device protects drinking water from contamination. 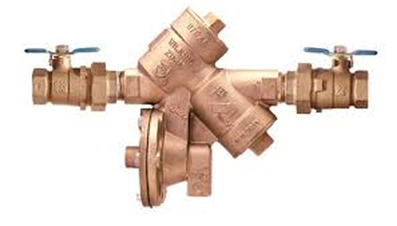 By installing a valve in your system it will stop the backflow from occuring. The state and city building codes dictates that these valves be installed in systems that have the probability of contaminated backflow and requires that the valve be tested for proper operation every year.